Two professors envision a trail connecting the campus with our community. 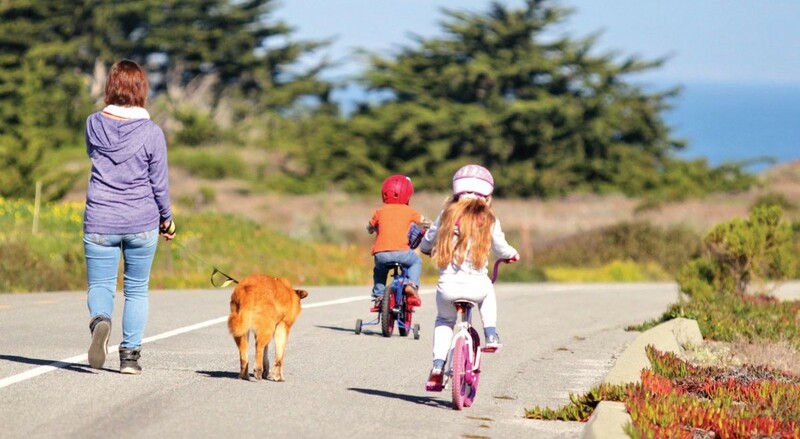 The Fort Ord Rec Trail and Greenway – commonly called FORTAG – is a sprawling three-loop trail that will connect Marina, Seaside, Del Rey Oaks and Cal State Monterey Bay. View a gallery of maps of the envisioned trail system. Before FORTAG, a number of advocates envisioned a trail from the beach to what was, at the time, land managed by the Bureau of Land Management. “Fred and I came to that project separately,” explains Waltz, an associate professor in Liberal Studies. “But we ended up talking with one another and Fred suggested actually looking, given the current state of development, at what that corridor would look like. That was an estimated 240 meetings ago. The work they’ve put in is impressive. In November 2016, Monterey County voters approved a sales tax increment to fund a number of transportation projects, totaling $600 million. The Transportation Agency for Monterey County (TAMC) identified FORTAG as one of those projects, slated to receive $20 million, with an additional $1 million coming directly from TAMC’s state funding. That is about half of the total budget needed to make this dream a reality, says Watson. “The next thing in front of us is to do a formal environmental review. We’re environmentalists and we hug trees, and we side-step every little thing that might be impacted by trail, because it’s a paved trail. It’s fundamentally about enhancing nature through people’s connection to nature and developing stewardship of nature,” Watson says. TAMC has stepped up to be the lead agency for the environmental review, which Watson estimates will take about 18 months. The EIR consultant will come on board in the summer, with work projected to last through December 2019, which will then give a “better sense of when the entire trail will be built and what parts will be built first,” explains Virginia Murillo, TAMC project manager for FORTAG. Two CSUMB professors envision a trail network connecting the former Fort Ord to the sea. Fred Watson teamed with fellow CSUMB professor Scott Waltz and other volunteers to launch the Fort Ord Rec Trail and Greenway, aka FORTAG. Once the EIR is certified, contracts will go out for final design and construction, a portion of which will depend on finding additional funding sources. The professors say that CSUMB’s backing proved to be a huge turning point for the project. Waltz and Watson also said CSUMB planning staff has been very supportive. “We have been absolutely folded right in to the Master Plan. So the university hasn’t just been supportive, they’ve basically said, ‘We want part of this to be ours for our community,’” says Waltz. Hikers on an existing trail where FORTAG will build a route. “If you pull back and look at the whole trail route you can imagine it as three loops or three wheels,” Waltz says. “There’s a circuit that traces around the city of Marina and reaches out into some of the areas just beyond Marina that are largely undiscovered at this point. There’s a loop that goes down and follows the rec trail to the Canyon Del Rey area, that goes through the parks there, that we call our sort of ‘string of pearls,’ and then comes into Del Rey Oaks and up. FORTAG will also be accessible. “The accessibility allows for paralympics and para-athletic events, which are taking place in the region, and we could create a perfect event course for that, too,” adds Waltz. A public pathway that would stretch from the sands of the Monterey Bay National Marine Sanctuary to the steppes of the Fort Ord National Monument is poised to start environmental review. Watson hopes the trail draws people from all walks of life. “Across the whole system we want to create opportunities for people to do outdoor art installations, or outdoor yoga pads, or painting clubs, or birding clubs, lot of opportunity for native plant restoration - at the professional level but also at the level of getting kids engaged in creating a native planted landscape and maintaining that. For youth fitness programs, both formally through public schools and private schools, and also informally.